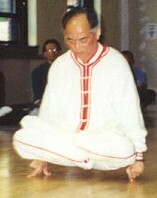 Master Zhou is a Qigong master from Nanjing, China. He has been in the US since 1995. He sees patients at East Gate and has a private practice in Winston-Salem. He also has ongoing Qigong classes in Greensboro. Master Zhou has practiced Qigong for over 75 years and has extensive experience in Qigong theory, Qigong treatments and various Qigong forms and Traditions. In China he was recognized as a "Master" in several lineages of Qigong. He also treated patients at the Nanjing Naval Hospital, had a private practice, as well as, taught many students.